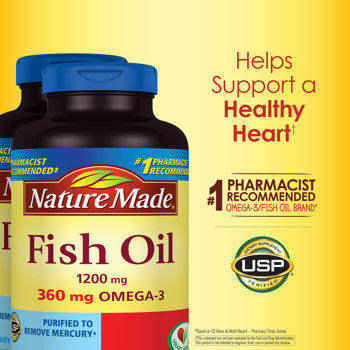 Nature Made® Fish Oil 1200 mg - 2-Pack 400 Softgels (200 softgels per Bottle) SALE! What are the benefits of fish oil and what is the recommend amount of omega-3? No Artificial Colors. No Artificial Flavors. No Preservatives. No Yeast, Starch or Gluten. 1 Mozaffarian D, Wu JHY. (n-3) fatty acids and cardiovascular health: are effects of EPA and DHA shared or complementary? J Nutr.2012;142:614S-625S. 2 Musa-Veloso K, Binns MA, Kocenas A, et al. Impact of low v. moderate intakes of long-chain n-3 fatty acids on risk of coronary heart disease. Brit J Nutr.2011;106:1129-1141. 3 Kris-Etherton PM, Harris WS, Appel LJ. Fish consumption, fish oil, omega 3 fatty acids and cardiovascular disease. Circulation. 2002; 106:2747-57.